View all local activities :: e.g. events,ameneties or classes etc. ,The following are currently available in the area. 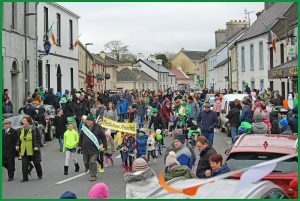 Some photos from Liam Donoghue from an impressive parade : 17th March 2018 . Thank you to all participants and spectators who turned out on a bitterly cold day . Hope to see you all again next year . The Shrule vintage autojumble this year was well attended and luckily the rain stayed away. Thanks to all who contributed to the success of the event . c/o Information Hub, Shrule Community Centre, Shrule, Co. Mayo. Welcome to the first issue of our community Newsletter. Our aim in publishing this Newsletter is to create a platform for local news, announcements and developments within our community to be shared and distributed among us all. We hope to distribute an issue every two weeks. Categories: Community centre, Events, GAA, News items, Newsletter.